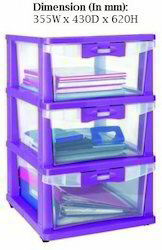 Our product range includes a wide range of industrial steel locker, plastic storage cupboard and steel plain cupboard. Steel 18 door Industrial locker with Pad locking arrangements, card holder, air hole & round bush for handle and GEM paint fineshed Fabricated with 20/22Gauge CR steel sheet. STEEL PLAIN CUPBOARD Size: 78”H x 36”W x 18”D Steel plain cupboard with five adjustable compartments & godrej lock. Made of 20/22 Gauge steel CR sheet with painted finish.